This marathon has been entwined with writing my book since the day talks began with my publisher, as the deadline for the writing has always been the day after the marathon. Some people groan when I tell them that, but honestly, the day after is perfect. If the deadline was a week or two after the marathon, my head would've been full of all the things I needed to finish and stress on getting everything done. Having the deadline the day after meant everything was already finished, I could relax, and use the race not only as a celebration of all my hard training, but a celebration of writing a freaking book, too! 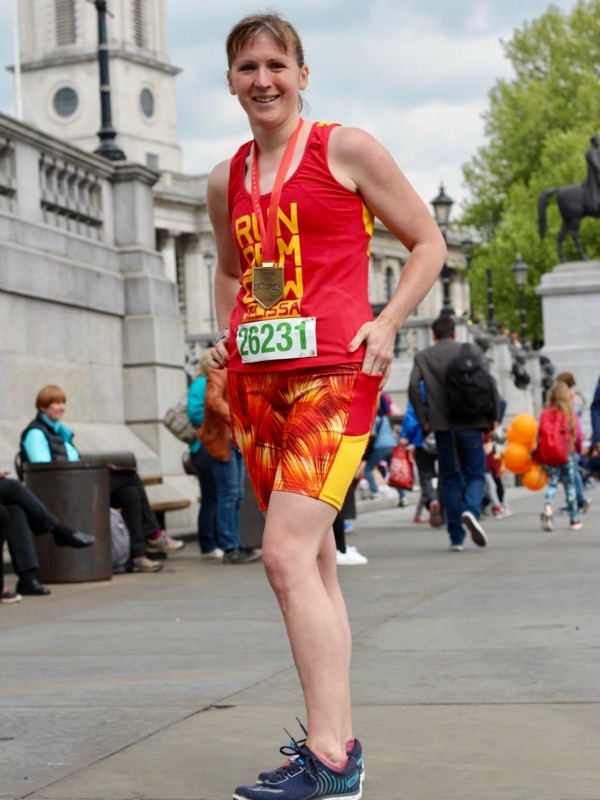 My publishers asked if I wouldn't mind running the marathon in designs from the book to help with marketing down the line, and as it turned out, I was able to squeeze in not only a pair of shorts but a top as well! I've run all 6 of my previous marathons in me-made gear, but I usually wear a Run dem Crew shirt or vest on top. This time I wanted to both rep my crew AND show off my book designs, so I made my shorts and vest from modified designs which will appear in my book (coming out early 2018), and took the vest up to Big Teezar in Camden to get the RDC logo and my name vinyl printed onto the front. This marathon has been entwined with writing my book since the day talks began with my publisher, as the deadline for the writing has always been the day after the marathon. Some people groan when I tell them that, but honestly, the day after is perfect. If the deadline was a week or two after the marathon, my head would’ve been full of all the things I needed to finish and stress on getting everything done. Having the deadline the day after meant everything was already finished, I could relax, and use the race not only as a celebration of all my hard training, but a celebration of writing a freaking book, too! 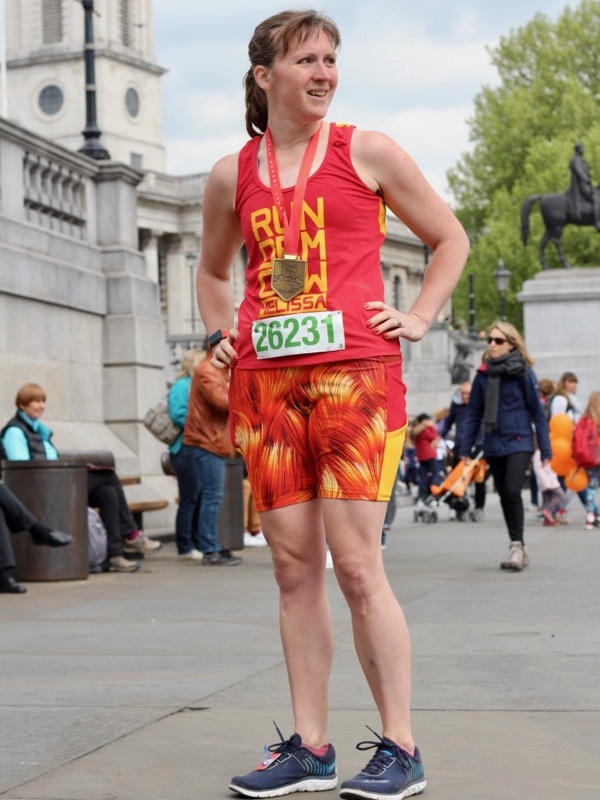 My publishers asked if I wouldn’t mind running the marathon in designs from the book to help with marketing down the line, and as it turned out, I was able to squeeze in not only a pair of shorts but a top as well! I’ve run all 6 of my previous marathons in me-made gear, but I usually wear a Run dem Crew shirt or vest on top. This time I wanted to both rep my crew AND show off my book designs, so I made my shorts and vest from modified designs which will appear in my book (coming out early 2018), and took the vest up to Big Teezar in Camden to get the RDC logo and my name vinyl printed onto the front. 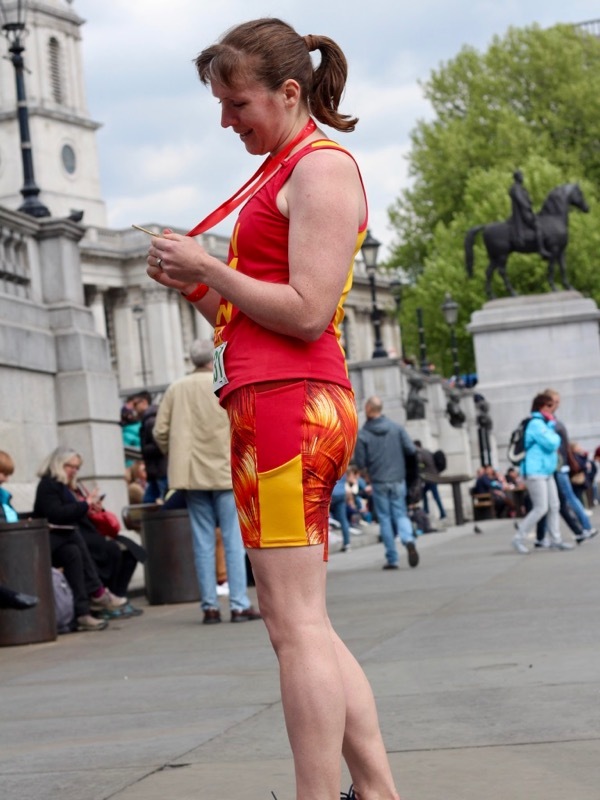 Now, I know what you’re thinking – “those shorts just look like her Duathlon Shorts, what a cop-out!”  These shorts are actually a leggings design from my book chopped off above the knee, which unfortunately cuts out a lot of the design interest! But I can assure you that those side panels are a) wider than the Duathlon and fit even the phattest of your freaking enormous phones, b) constructed differently than the Duathlon, c) contain twice as many pockets as the Duathlon (two on each side! ), and d) those panels don’t just extend straight down the entire side of the leg, ‘cos that would be boring! And then I went and added an additional back waistband pocket (included in my Steeplechase Leggings pattern) onto these just for good measure bringing the pocket total up to FIVE. FIVE BIG POCKETS, PEOPLE. I was actually a bit concerned during my test run a few weeks ago that I’d need braces (suspenders) to hold them up when fully loaded with gels, ha! In reality, the gels were not problem at all, but I do notice in the photos that my phone in its heavy battery case is pulling them down a tad on the right side (I only ever need the battery case for 3+ hour runs when I use my AppleWatch for pacing). My vest is a hybrid of two of the top designs from the book, taking the offset side seams of one design and using the neckline and armholes of a different vest design (and I tweaked the ease to be somewhere between close- and loose-fitting, too). I know what I like for racing, and I wanted it to be perfect! As I made the vest only a week out from the race, I only got to test it on my last long taper run, which was just an hour. I opted to finish the neckline and armholes with my coverstitch binder and I don’t know what gods were smiling upon me that day but omg the binding went on all three lengths on the FIRST try, no seam ripping!! (I love my coverstitch to bits, but that binder attachment is a fickle, frustrating beast). 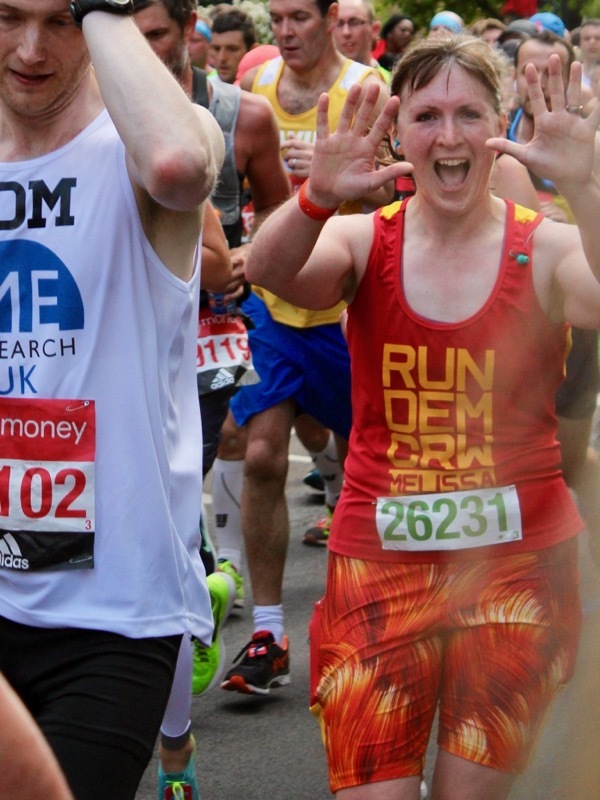 The only issue I had on race day was from the binding joining, which I chose to place at the underarm seam, because I’m vain and I didn’t want to have it showing at the shoulder (the only other place it could go). With a coverstitch binder, you have to attach it flat rather than in the round, so you have to then sew the final seam with the two binding edges together, which creates a little bump, even if you topstitch it flat afterwards like I did. I didn’t notice it during the race, but afterwards I realised I have a nice big chafing patch on the soft, inner bit of my upper arms where my arms were swinging and rubbing the binder join. Serves me right for my vanity – next time I’ll just join it at the shoulder where nothing can brush up against it! With the marathon and the book out of the way, I’m taking a well-deserved rest this week before heading off to Copenhagen for a long weekend with friends (hello, Stoff & Stil! ), and then starting my new office job next week. Because I really need a mental break as well as a physical one right now!! If you’d like to read all about how my race went (spoiler alert: another GFA/Boston Qualifier, but very hard earnt! ), head over to my running site to read my full marathon race report. 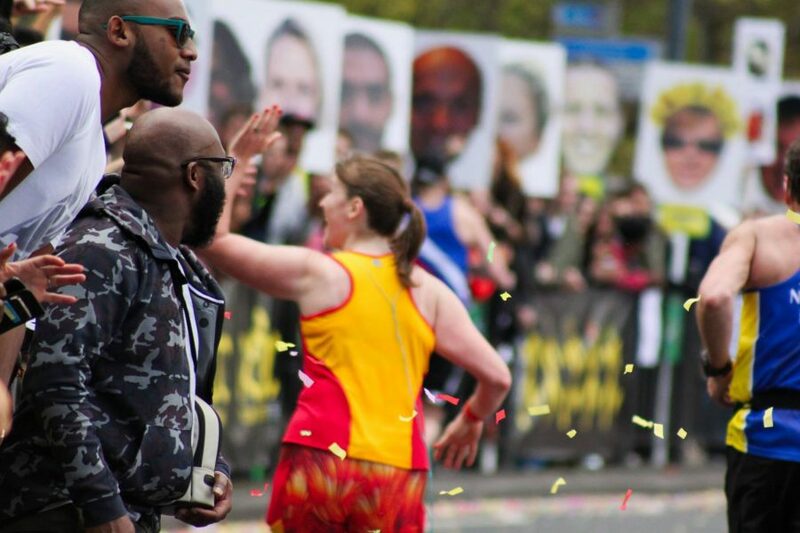 And if I’d inspired you and you’d like to contribute to my fundraising for my next big race, representing Team GB at the World Transplant Games, then you can donate here. Separator image Posted in Gallery and tagged with book, exercise, fehr-trade-patterns, knit, sew your own activewear, shorts, SYOA active leggings, SYOA raglan tee, top. Hi Chris. Thanks for asking! It’s all going through JustGiving, who accept credit cards and paypal. If you’re in the UK, you could also send me a bank transfer, but there’s no way to get the GiftAid or tax documents if you pay me directly, I’m afraid. By accident I find your blog. 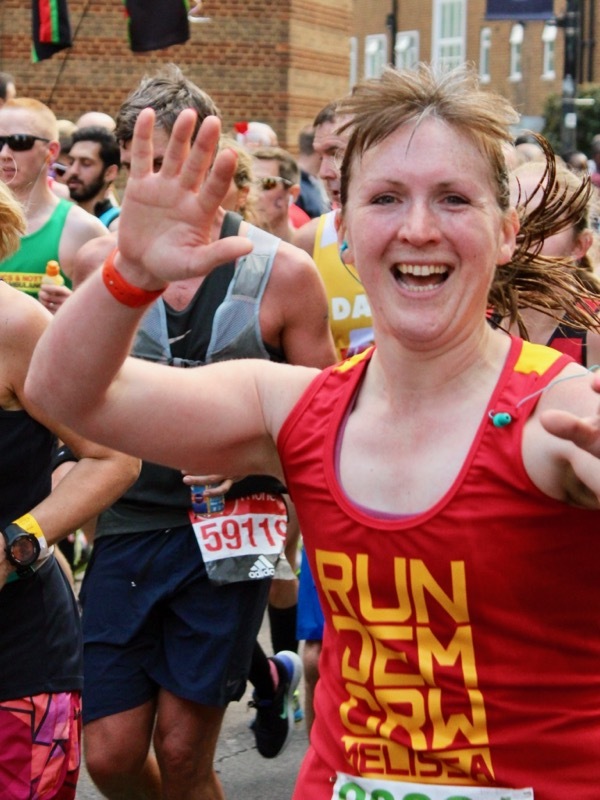 Congratulations on you London Marathon result. I am a runner and I do marathons sinds 2010. I sew a lot of clothes but I really like to sew my own running clothes. i sew since I was 11 years old. How great that you are writing a book about sports clothes. So I do not have to find out all by my self. Where can I buy it? You also wrote article in Threads190. Does it has patterns too? So I can make a start as I have to wait for your book. Hi Dorothé. Thanks so much for your enthusiasm, but my book won’t be out until early 2018! In the meantime, you can sew my activewear patterns which are available from shop.fehrtrade.com (you can see my Steeplechase Leggings, VNA Top, Duathlon Shorts, and Tessellate Tee in my Threads article). Congrats on Rotterdam and good luck for your next marathon! 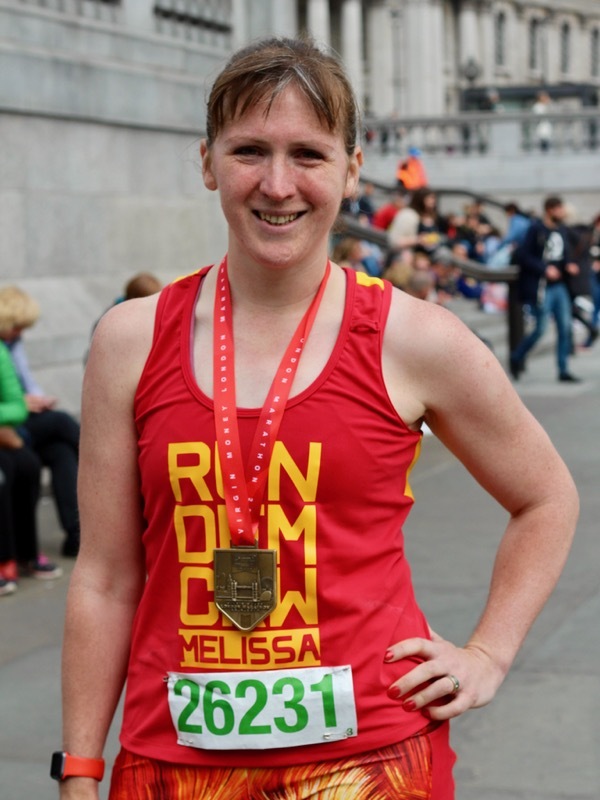 Congrats on your run Melissa even if it didn’t tickle your PB. Given your last year, I think it’s great! Are you pleased with the results of the new style of training (Maffetone, right?)? And the binding on your vest is exquisite (the whole vest is great with the personalization and earbud keeper). What a good day when you sewed that. thanks so much! I didn’t really have space to go into coverstitch binding as it’s still a fairly niche hardware setup, but I do go into a whole other bunch of edge-finishing techniques. And yes, I really do think the Maffetone fat-training is helping – maintaining marathon pace was way easier than in previous years (if only my legs had kept up!). I say Hulk Hogan for sure! Not enough yellow for Mickey Dees (a good thing!). Love it! Your marathon togs are certainly nice and bright, Melissa and well done on completing the race4. I have a pattern and material for some workout stuff (Kwiksew pattern – I think from before you ever started marketing patterns) that I haven’t made up yet and I think I’ve had them since Adam was a lad. The lady who took the keep fit class hurt her leg and so the class fell through though there’s really no reason I couldn’t do a bit of exercise in a (hum-hum) mature lady sort of way at home. One of the good things about the class was that it was run by U3A which is for retired and semi-retired people. I need to make some leggings – not for marathons though – but it’s getting the right percentage of stretch in the fabric that is the problem for me – they can either be too loose or too tight – there was only one pair I made that were “just right”. The coverstitch machine seems well handy but I don’t think I’ll invest in one at my time of life – I found the thread plate for my conventional machine today quite by chance even though I couldn’t find it when I looked for it expressly. So at least I can do some sewing on the machine now – hand sewing is certainly slow. The reason the class being for retirees was good (for me at least) was that I am a retiree myself.